A couple weeks ago, my friend Erin Connelly over at The Commons in Charleston sent me some pics of something quite special....dare I say spectacular. 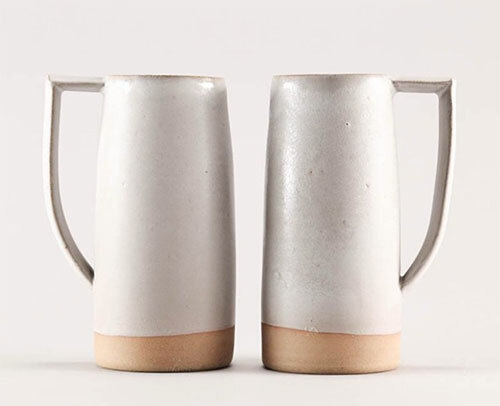 Erin, along with her design and business partner, Kerry Clark Speake have produced their first collection of ceramic vessels and glassware. It's called The Shelter Collection and it is the only line of glassware manufactured exclusively in the South. Erin and Kerry were inspired by mud hut dwellings as they designed their simply stunning collection. Learning about their process I loved reading that the mud hut is "the strongest architectural shape using the least amount of materials." Together, Erin and Kerry work with local craftsmen and the nonprofit, STARworks in Star, North Carolina to see these beautiful vessels come to life. There are 14 different pieces in the Shelter Collection which include small, medium and large cups, glass pitchers, a coffee mug and tea (or beer) stein. The pieces are made from clay sourced locally in Seagrove, North Carolina, the handmade pottery capital of the United States. This area pictured above is an historic pottery region known as the Michfield clay site, which has produced a light gray, chalky clay for hundreds of years. How wonderfully amazing is that? The pair experimented with dozens of glaze options before settling on this one. As stated on their site, "No detail was left unexplored from the finish of the ceramic glaze, selecting one that perfectly warms the hand with tea but does not burn, to the shape and feel of the glass opening and weight." What an accomplishment to set out to make your very own glassware collection that is locally sourced and made by hand here in the South. The NY Times recently featured their work in T Magazine...one of my favorites. This is inspiring work and a reminder that we can still make the South a thriving hub of beautiful, locally made goods. Learn more about The Shelter Collection, here.